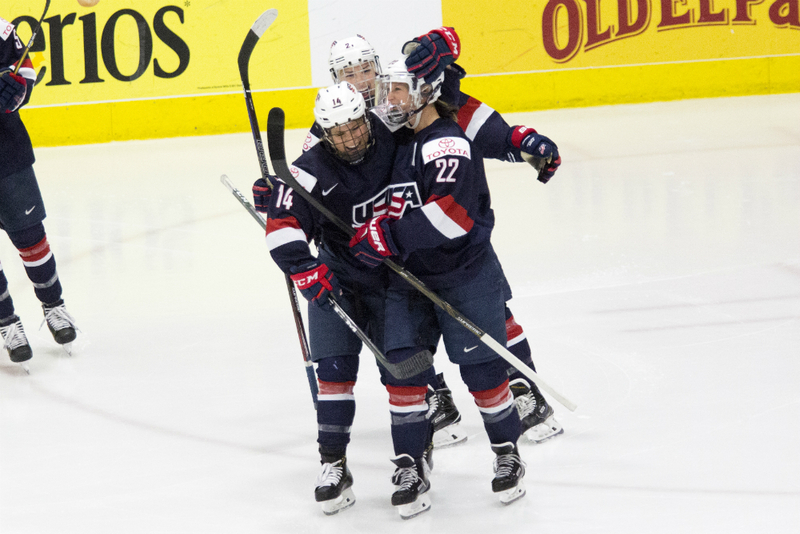 The United States has won every women’s hockey gold medal in 4 Nations, World Championship and Olympic play since April 2015, and they’ll look to keep that streak going this week in Saskatoon. The U.S. women’s national team is going through a bit of a transition, however. After a short tenure for Robb Stauber, Bob Corkum was named the team’s new head coach last week. Prior to that announcement, USA Hockey also announced director of women’s hockey Reagan Carey would be stepping down from her position to pursue other opportunities. Carey had held that role since 2010, and the timing of the announcement is certainly interesting, given that it came right before a major tournament. So, Team USA will head into 4 Nations Cup play with a new head coach and nobody in the role of general manager. Here’s a look at their roster for this tournament, by position. There are a few big names missing up front for Team USA. Monique Lamoureux-Morando and Jocelyne Lamoureux-Davidson, whose gargantuan efforts back in Pyeongchang helped the team to its first Olympic gold medal since 1998, are both starting families. Meghan Duggan, the team’s captain of the previous five seasons, is also not playing. Those are some big holes to fill in the roster, but the U.S. has plenty of talent to draw from to hopefully do the trick. Brianna Decker has been nothing short of excellent for the Calgary Inferno this season, her first in the CWHL, and her skillset is second to none. Hilary Knight, as usual, is expected to contribute in a big way, as is Kendall Coyne. Amanda Kessel’s Metropolitan Riveters have struggled to start the season in the NWHL, but she’s leading the Riveters in scoring with a goal and five assists for six points in six games. She’s a key player for Team USA, too, because of the speed and vision she brings. Annie Pankowski is back in the mix after a surprising mid-season cut last year (the U.S. Olympic roster was supposed to be set going into the season), and with some players missing, I think she’ll be looked upon to have a sizable impact in this tournament. Hannah Brandt and Dani Cameranesi were both leaders up front for Minnesota in college, and they’re doing the same now for their NWHL teams (Minnesota and Buffalo, respectively). Kelly Pannek is a senior for the Gophers now, and though she hasn’t had a breakthrough for Team USA yet, she adds another layer of offense to the line-up. Caitrin Lonergan, Sydney Brodt, and Melissa Samoskevich are all cracking the U.S. senior team roster for the first time after good showings at camp in the offseason. All three are also still in the NCAA ranks. Production-wise, Lonergan has shown she deserves a chance at the next level without a doubt. She was second in the country in scoring last season with 30 goals, 45 assists, and 75 points. While Brodt and Samoskevich haven’t quite broken out on the national stage like that, they’re still proven leaders for their teams. Samoskevich has carried Quinnipiac’s offense for two seasons now, and Brodt seems to be a player the staff feels they can trust even without big offensive numbers. Veteran Gigi Marvin is also back with the team as a forward, though she’s played a lot of defense the last few years. She was mostly used as a depth player in Pyeongchang and it’s likely she’ll play the same role here. At this stage, especially when trying to give younger players a good look, she’s most valuable in that spot. Outside of Lee Stecklein (a notable omission), Team USA returns all of the same defenders that won gold at the 2018 Olympics. That gives the team a good amount of experience on the blue line, and players who have proven to be reliable in their roles. Kacey Bellamy is the USA’s most experienced veteran on defense. She’s always shown good vision and has been a cornerstone D for the team for a long time. Megan Bozek, who like Pankowski was a surprise cut leading up to the Olympics, is also back with Team USA. When she’s on her game, she’s a dominant two-way defender, with the ability to lead the entire defensive corps. The quartet of Boston College defenders is also back with Team USA: Megan Keller, Kali Flanagan, Cayla Barnes, and Emily Pfalzer. I’ve always liked the way Keller sees the ice, and her play-making instincts are generally very good, but she has a bit more rounding out to do to be a true top D at this level. We’ll see if she can take that next step here. Flanagan is very quietly a worthy defender; there’s rarely anything jarring you see in her game. Barnes was a late addition to the Olympic team last year but was basically running Team USA’s defense in overtime of the gold medal game. She’s only a freshman at BC after redshirting last year, so there’s a ton of potential for her. Pfalzer graduated from BC a few years ago and plays her professional hockey with the Buffalo Beauts. She’s an important piece to the team because of the way she can jump start the offense in transition from the back end. Sidney Morin is another returner from the Olympic squad. She jumped into a role with the national team fairly well and has shown she can be solid defensively at this level. She’s third in defender scoring in the SDHL this season with nine goals, nine assists, and 18 points for Linköping HC. After a good showing with the U.S. Under-22s this summer, Mikaela Gardner is making her senior team debut this week. With Wisconsin in the NCAA, she’s taken on a lot of responsibility in terms of driving offense and jumping up in the play. She seems to thrive in that type of role, but we’ll see what situations Team USA uses her in for this tournament, and how well she adjusts to the level of competition. Maddie Rooney and Alex Rigsby, who were both on the Olympic squad, are back for Team USA. Rooney was the team’s starter and put on an outstanding performance in the gold medal game and, of course, the shootout that followed to help her team clinch gold. Rigsby has seen a good amount of action before for Team USA and is also a capable starter. Emma Polusny is the team’s lone newcomer in goal. She was great as a freshman for St. Cloud State last season, posting a .934 save percentage in 20 games. She’s splitting time with Swiss Olympian Janine Alder, but has helped the Huskies to three wins already this season.